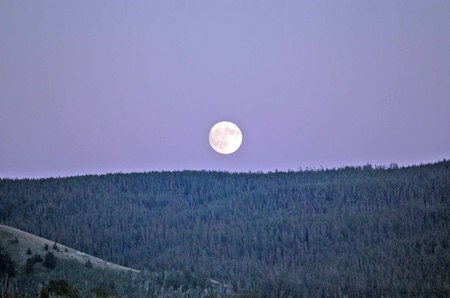 On Monday, August 18, we had to leave our cushy suite at the Old Faithful Inn in Yellowstone, to travel on to our next stop: Little Big Horn in Montana. 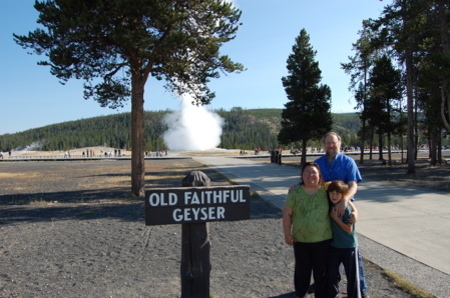 We went out for one last view of Old Faithful and to find a kind soul to take our picture. We met an older gentleman from Tennessee, who was very knowledgeable about the park, and said he'd been coming there since 1968. Frank had met him on one of his early morning photo walks, and he gladly snapped our picture for us. We drove out of the park after another hearty breakfast at the Old Faithful Inn dining room, and headed toward the Northeast exit/entrance at Roosevelt. Our first stop on the way was Artists Point, a beautiful, scenic spot with a view of the yellow rocks and the falls in the distance. I could see why this was called "Artists Point" since this was just about as inspirational a scene as anything you would find on the planet. We didn't see any painters around, but hundreds of tourists with all makes and models of cameras swarmed the area, looking for a good shot of the falls and the canyon. I think between the two of us, Frank and I took about 10,000 pictures of this spot alone. The rock on either side of the falls had a yellowish hue, which changed colors in the sun. 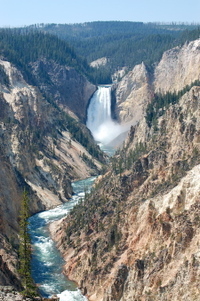 According to Frank, this was why the park is named "Yellowstone" after the yellow stones near the falls. The water coming off the falls and into the canyon was a gorgeous deep turquoise blue, almost as blue as the ocean in the Caribbean. The rocks, the deep green pine trees, and the blue rushing water made for a a festival of color. We left just as another bus load of elderly tourists pulled up and headed on out of the park. I was sad to leave Yellowstone, despite being sick the entire time. We got to see one last herd of buffalo on our way out, and one that was pretty close to the road. 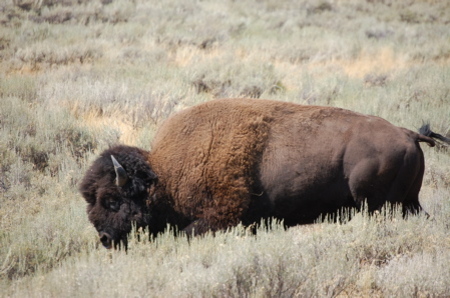 Luckily, buffalo are not the quickest creatures when they are undisturbed and grazing, so I got a fairly good shot of one of them by the roadside. We woke up at the Old Faithful Inn and looked out the window to see Old Faithful sputtering and smoking, with a smaller crowd than later in the day. 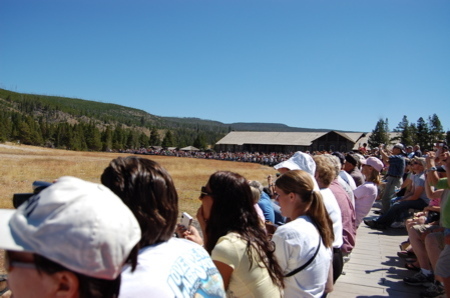 The tour buses usually pull up in the afternoon and hordes of people descend to see the famous show. Early in the morning, it's just the people staying nearby and a few park employees passing through. 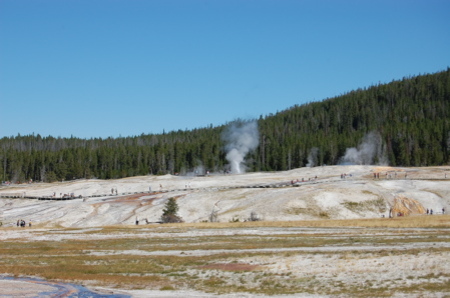 Off in the distance, we could see other geysers smoking on the rocky plain. We've been on the road for a week, so it was time to check out the laundry facilities so we could have fresh clothes and get ride of the stinky stuff in our luggage. The laundry is conveniently located next to the Medical Clinic, so I went to be checked out by a doctor. My bronchial crud disease seemed to have taken hold with a vengeance, and my voice is hoarse from coughing and not very pleasant to listen to, I'm sure. According to the doctor/nurse/medical person with a stethoscope named Eddie, I have some kind of allergy/asthmatic condition brought on by the fact that things are blooming in Yellowstone and the high altitude. He gave me an inhaler, said he saw no signs of infection, and $250 later, I was on my way to fold laundry, feeling no better than when I went in. I took a few hits off the inhaler, breathed a little easier, and continued to sound Marge Simpson and Harvey Fierstein's love child. Our first morning at Yellowstone, I woke up hearing someone loudly coughing and hacking and groaning. It took me a minute to figure out that someone was me. I woke up with some kind of bronchitis/cold/crud that wasn't helped at all by the high altitude. Frank was up at dawn to go out to take pictures in the morning light, and didn't return for several hours. I was beginning to worry a little that he might have been Smokey the Bear's breakfast, but then he came bounding in and was enthusiastic about his photo excursion. I told him I felt like crap on a stick, which I'm sure was quite a downer for him. Just call me "Mrs. Buzzkill" henceforth. 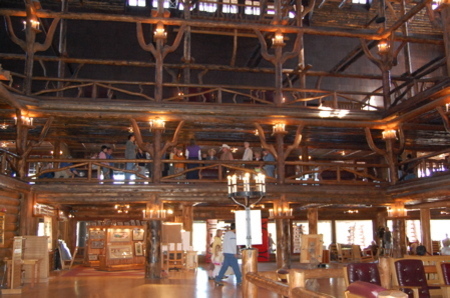 We are staying in the historic Old Faithful Inn, built in 1904. They've modernized it quite a bit, but the rustic beams in the four-story atrium are signs of a bygone era. The hotel was nearly destroyed in the 1988 wildfires, but a great deal of work by firefighters saved the Inn. It's a marvelous place, and you have to book reservations at least 6 months in advance. The first time Frank called in February, they were booked solid, but he was persistent and got one from a cancellation on the second or third try. We had to settle for a suite (bummer, I know), which was more than we budgeted for, but the only thing available. The suite is a spacious, two room mini-apartment, with a fridge and complimentary soft drinks and a box of chocolates. For this price, you can bet we will be sucking down those soft drinks with wild abandon. My dentist will certainly not be pleased. We ate at the all-you-can stomach buffet in the Inn, loading up on scrambled eggs, french toast and breakfast meat. We decided to venture out to one of the other lodges for some shopping and to see the morning eruption of the Old Faithful geyser, just across from the hotel. On Friday, the fifth day of our Great American Family Roadtrip, we checked out of our hotel in Jackson Hole, Wyoming, saying goodbye to their biker clientele and excellent wifi connection. We had breakfast for a second time at The Bunnery (it was that good), and shopped along the main street. Alex and Frank went to the Ripley's Believe it or Not Museum, while I headed to a mountaineering shop to buy some walking sticks for our next hike, and other gear for our trip to Yellowstone. There was an Art Fair in town with a few hundred artists selling their wares in the local park. We browsed the exhibitors' booths while Alex made fast friends with a little girl named Lori from Denver and played on the playground with her. Frank sat down to keep an eye on Alex, and I went off to look at the inner row of exhibits. I came to one that I particularly liked, by a fellow named Owen Mortensen from Utah, called Botanical Art. Owen's art is very simple, and uses pressed leaves and flowers to create simple designs on clean backgrounds. I really liked his aesthetic, and dragged Frank back to the booth to see a large piece with Ginko leaves that I liked. Frank thought it was too big to fit in our space, but we agreed that one featuring small tropical leaves would work. We ended up buying two pieces from him. I also bought a set of handcarved salad tongs from another vendor to replace the ones I broke recently. We rolled into Jackson Hole, Wyoming late Wednesday night, and couldn't see much of anything other than one big elk crossing the road on the dark mountain pass. We woke up to find ourselves in what looked to me like Cowboy Disneyland. 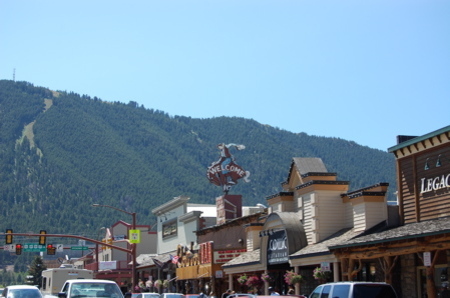 The downtown is a quaint, western-themed array of high-end shops, souvenir shops, bars, and restaurants. 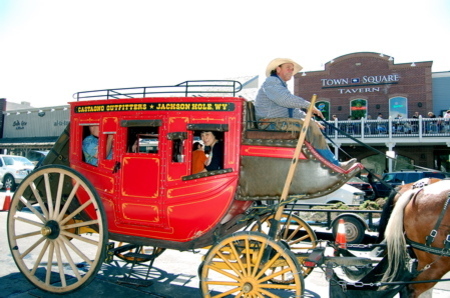 Instead of horse-drawn carriages or taxis, tourists ride around in mock-stage coaches.